Your employees are the lifeblood of your business. They help you achieve your goals and they’re often the reason you stand out from your competitors. 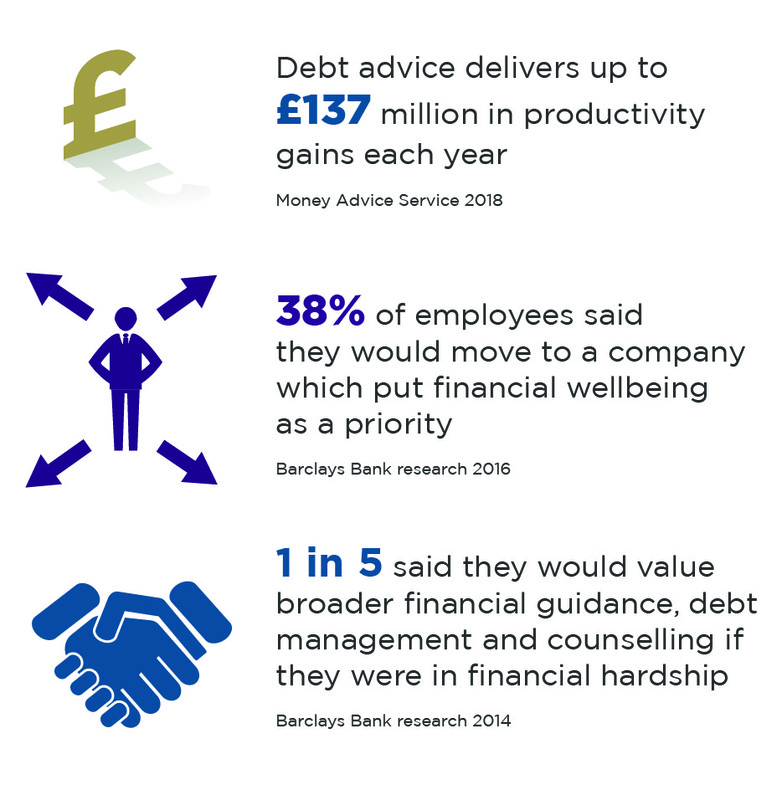 We know that happy employees tend to be more productive, but did you know that personal debt and its impact on staff wellbeing has become a key issue across the UK? Financial wellbeing is about having the confidence and peace of mind to make personal financial decisions. A number of money worries can affect financial wellbeing at any stage of life, from worrying about paying debts to concerns about saving for the future. As well as causing stress and anxiety, poor financial wellbeing can also influence productivity at work which ultimately has an impact on your bottom line. In a study by the Chartered Institute of Personnel and Development, 25% of employees said that money worries have affected their abilities to do their jobs. In cases we’ve assisted with, many of the employees have said that the worry of debt was a regular distraction from their work and as a result, they felt their performance suffered. Some also mentioned taking time off work due to stress. But all agreed that they felt a lot better about their situation, once they’d talked it through with someone. Including financial support and education as part of your employee wellbeing programme can help your employees work better, create a content workforce and have key tangible results for your business. It’s important to support your employees in becoming more financially capable. Building in financial wellbeing education into your employee assistance plan can set you up to achieve this. By investing in your employees' financial wellbeing, you're investing in your business. Personal debt is a sensitive topic and as an employer you may feel it’s a difficult one to tackle directly. Which is why having access to an empathetic ear and trusted, confidential advice is an invaluable resource. Our team have dealt with personal debt problems across all areas from council tax and mortgage arrears to credit card debts and payday loans. Whatever the debt problem we are here to help find the solution. We have a highly experienced team who you can confidently put your employees in contact with, knowing they will be getting independent, comprehensive debt advice with their best interests at heart. Money Advice - the employee journey with Johnston Carmichael from Johnston Carmichael on Vimeo. We will work with you to consider how we introduce our service in a confidential and discreet manner using a variety of methods that suit your needs and preferences. If you would like to find out more about the debt relief support we can offer your employees and how we can work with your HR teams, please get in touch with me at: Donald.McNaught@jcca.co.uk, to arrange a chat and support the people that are important to your business.